Yesterday I mentioned perspective in my blog. Perspective can relate to many different aspects of ones life. I loved slowing down a little to really appreciate all the different ways I can view my life, my community, my relationships, and my travels. I experienced small children giggling, wind chimes making their music in the breeze, leaves crunching under my feet, the last of the insects attempting to survive the chilly weather, the pride in a project completed, and the energy of my teenage boys (they come into our home like a whirlwind, eat and are gone just as fast!). I love the perspective of this photo. I love that the small yellow leaf adhered itself to the tinted window of my truck. 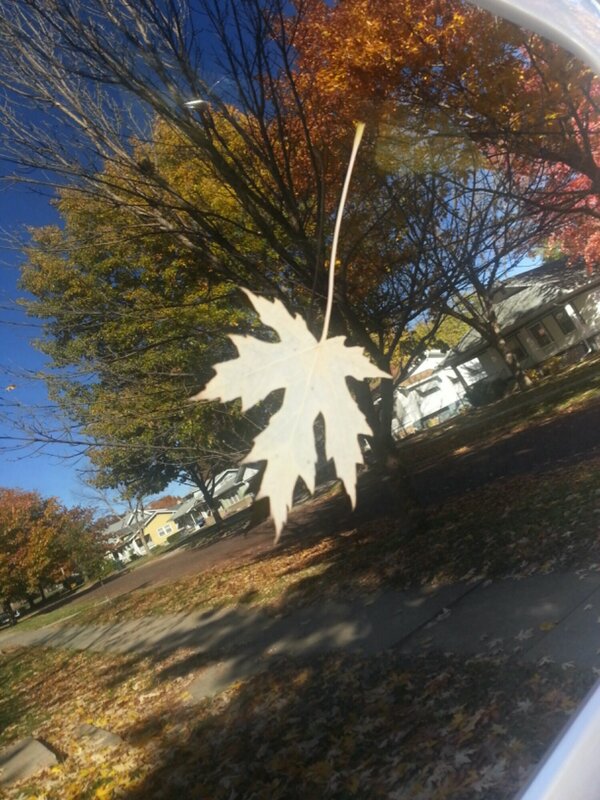 My intention was capturing a fallen leaf no longer blowing in the wind but securely stuck to a window. What I actually captured was a different perspective of a quiet neighborhood.